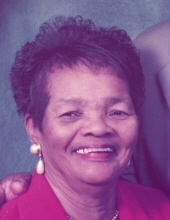 Betty J. Stewart, 89, a longtime Parsons resident, passed away at 8:45 a.m., Monday, April 1, 2019 at her home. Betty was born to Arnold James and Ruth Mae (Redmond) Robinson on April 26, 1929 at Parsons, Kansas. She grew up in Parsons and graduated from Douglass High School. Betty had special memories of school especially being nominated the high school Queen and basketball cheerleader. She also met her high school love Wilson Stewart, Sr. and they were married on December 20, 1951. To this union six children survive; Sharon Stewart-Brown of Parsons, Debbie Robinson, and her husband Eddie of Parsons, Wilson Stewart, Jr., and his fiancé, June of Rock Island, IL, Jeffery Stewart, and his fiancé, Marelvy DeLaCruz of Los Angeles, CA, Aaron Casserly Stewart, and his husband, Peter of Sheffield, United Kingdom, and Dr. DeShawn Stewart, and his wife, Simian, of Wichita Falls, TX; a host of grandchildren; and great-grandchildren. Betty was a devoted wife and mother and very proud to have the opportunity to be both. Wilson Sr. was the man of the house but Betty was the financial “Captain of the Ship”. Betty’s work years consisted of housekeeping for Mark Piper and Glen Jones, two outstanding families in Parsons, a day care provider, which she enjoyed being a part of so many children’s lives, Day and Zimmerman as a machine operator, where she had the opportunity to meet and work with great people, at Parsons Middle School as a paraprofessional, which was a rewarding opportunity to work with special children, they kept her life in perspective. The most rewarding job was “Homemaker” she was very proud eventually to be able to stay at home and take care of her husband and children. Betty’s special time of the year was Christmas, she loved shopping and decorating her house. She would start in November and Christmas would continue until the end of February. She loved this season so much. Her house was decorated to the hilt with every area of the house being covered with some type of Christmas decoration. She would have many pictures of her perfect Christmas tree and decorative dining room table. One of her proudest moments was being a part of the Parsons Home Christmas Tour. It was always a special treat to have all the kids, grandkids, and family members home on Christmas Eve to open up presents with lots of laughter, good food, fun, and pictures. Betty was known in the community for her pie making skills and for many years sold pies at Day and Zimmerman. She loved to cook and her favorite food that her children loved for her make was turkey and dressing, with all the trimmings, especially the homemade rolls a skill which she passed on to her daughters. Christmas always had the magic touch with decorative sugar cookies and homemade candies; fudge was her specialty. Throughout the years she enjoyed sharing the family meals with neighbors, friends, and the elders on special holidays and Sunday dinners. She loved making crafts and crocheted a blanket for each of her children. Other special items she made were homemade Christmas ornaments and a four foot pine Christmas tree. She collected angels over the many years with the first one being given to her by her son Aaron when he was eight years old. As Betty grew older it was always a delight to play a card game of crazy eight with her daughters on Sunday after dinner and the trouble game with her grandchildren and great-grandchildren. Betty served on several boards in the community including the McKinley School PTA President, Senior Citizens Council, The Jewel Arts Club, Pokeno Club, and served as a Pink Lady at Labette Health. Betty was preceded in death by; her husband Wilson K. Stewart, Sr., her parents, Arnold and Ruth Robinson, three sisters, Zelda Riddick, (Bink) Mary Hatcher, Ruthleen Smith (Bo). Her additional survivors include her two brothers, James Arnold Robinson, Jr., and his wife, Phyllis of Rock Island, IL, Ronald “Ronnie” Robinson, and his wife, June of Wichita, two sisters, Arnell Thompson of Wichita and Sadie Wilson of Round Rock, TX. Funeral services will be held at 11 a.m., Saturday, April 6, 2019 at the New Hope Baptist Church, with her nephew, the Reverend Sylvester Thompson officiating. Burial will follow in the Oakwood Cemetery. The family will receive friends at the Carson-Wall Funeral Home from 6 to 8 p.m. Friday. Memorials are suggested to the Harry Hynes Hospice and these may be left at or mailed to the funeral home 112 N. 26th St. P.O. Box 942 Parsons, KS 67357. Online condolences may be left at www.wallfuneralservices.com. To send flowers or a remembrance gift to the family of Betty J. Stewart, please visit our Tribute Store. The family will receive friends at the Carson-Wall Funeral Home from 6 to 8 p.m. Friday. Funeral services will be held at 11 a.m., Saturday, April 6, 2019 at the New Hope Baptist Church with Rev. Sylvester Thompson officiating. "Email Address" would like to share the life celebration of Betty J. Stewart. Click on the "link" to go to share a favorite memory or leave a condolence message for the family.